Sony builds some of the world’s best camera technology—so good that even competitors like Apple and Nikon buy their sensors. Now, Sony’s cramming some never-before-seen, next-generation guts into three of its hottest cameras. The new A7R II, RX10 II, and RX100 IV are promising unheard of levels of performance. From the outside, it may not look all that different from its excellent predecessors, but the new $3200 Sony A7R II sounds like a beast for low-light photography and videography. 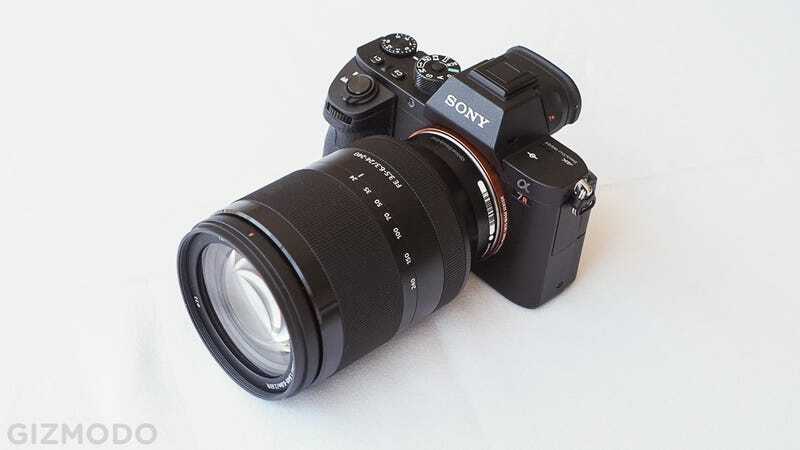 Sony’s says it’s created the first full-frame backside illuminated sensor, a 42.4 megapixel monster with a native ISO range of 100-25600 (expandable to 102400), a ridiculous 399 phase detection autofocus points (plus 25 contrast AF points for full frame coverage) and the 5-axis stabilization system that wowed us on the A7 Mark II. In other words, Sony’s promising this camera will basically see in the dark, lock onto targets like a guided missile, and keep them in sharp focus till you’re done shooting. Oh, and it’ll shoot 4K video using the entire full-frame sensor. But for best results without pixel-binning that causes ugly jagged edges, you’ll have to switch to a super-35 sized crop mode. Other additions include a redesigned grip and shutter button like the a7 markII, a silent electronic shutter mode, and an upgraded OLED viewfinder with a .78x magnification. Sony is also coming out with 5-inch 1080p monitor you can mount right on the hotshoe to check critical focus and exposure while shooting video (no price on that guy yet). Where does that all leave Sony’s $2500 A7S, the previous full-frame video champ? Not certain, but despite the Sony heralding the low light capability of the A7r Mark II, it still can’t match the super-duper high ISO chops of the A7S, which goes to 409,600. Sony now joins Panasonic and Samsung among those offering internal 4K video in a still camera. The most popular cams from those other companies each have big compromises. In the case of Panasonic’s GH4, the 4K video is great but suffers in low light due to the small sensor. In the case of Samsung’s NX1, a lack of lens selection and reliance on an under-supported codec hurt its case. If Sony delivers on their promise, indy filmmakers might flock to the A7r Mark II’s total package of high quality 4K video and high-resolution full-frame stills. We will see when it hits shelves in August. But let’s talk about Sony’s other two new cameras, the new RX10 and RX100. (Yes, that’s two different cameras.) The RX10 has a 24-200mm (8.3x) f/2.8 superzoom and lots of tactile controls, while the RX100 is obviously still a pocket cam with a 24-70mm (2.9x) f/1.8-2.8 for more up-close-and-personal shooting. The high-end compact and the high-end superzoom also share a crazy new sensor—a stacked CMOS chip that shoves the circuitry and some high-speed memory right up against the sensor for way faster performance. Sony says the image data comes out 5 times faster, and it lets even the pocketable new RX100 Mark IV boast some fancy features: like 40x super slow motion video capture, 16fps continous shooting, and an incredibly fast electronic shutter speed of 1/32000 second. The RX100 Mark IV, which is way, way smaller in reality than the RX10 II above. For comparison, the awesome RX100 Mark III topped out at just 1/2000 and Sony had to add a (much appreciated) neutral density filter to make it useful in bright light. Now, capturing shots in blinding conditions shouldn’t be a problem. (Sony says it can shoot wide open at up to EV19.) The pop-out electronic viewfinder should also help with that, and both the RX10 and RX100 still have the built-in ND filter. There’s also 4K video, again without cropping or skipping lines. It uses all the pixels on the sensor. Plus faster autofocus, and new dust and moisture resistance on the RX10. For reference: two seconds at 960fps is like 1.5 minutes in slow-motion. The implementionat on the slow motion is pretty slick: You can choose to either activate the slow-mo when you press the video record button, or you can set the record button to be an “end trigger.” This means that the camera will be running a buffer recording, so when you hit the button it captures the preceding two/four seconds, which is useful since so much of what you would want to see in slow-motion happens super fast. You’ll pay a pretty penny for these upgrades: Where the RX100 Mark III started at $800, the new Mark IV will cost $1000. The RX10 II stays at $1300. As for how they stack up to competition, well,they’re pricey cameras! The RX100 line has produced the finest point-and-shoot models you can buy for less than $1000 for years now. Even with the new 4K video capture and consumer-friendly slow-motion modes, $1000 is a lot of money. The 4K capture seems aimed at shooters more advanced than the traditional RX100 audience. Meanwhile people who want slow-mo might be willing to settle for the inferior but much cheaper 120fps recording from a GoPro. The most obvious competitor would be the Panasonic LX100. As for the RX10 II, this is a nice upgrade over the original. What was the original? It was an awesome camera, but more than $1000 always felt like an awkward price point. Both cameras will be available in July. We’ll update when we’ve had the chance to put those super guts to the test. Photos by Michael Hession.Addtional reporting by Mario Aguilar and Michael Hession.